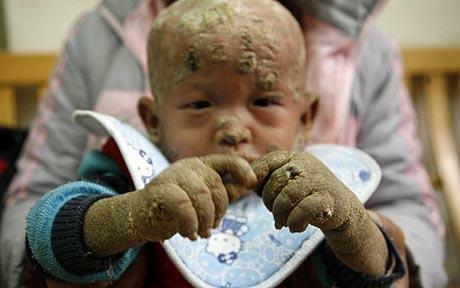 Song Sheng, unlike most 14-month-old boys, was born with a very unusual health condition. He was born without pores in his skin. This means that his body temperature is very difficult to regulate. He’s prone to fevers, needs cold ice baths consistently, and has developed a coating of fish-like scales which has caused locals to dub him Fish Boy. The condition, lamellar ichthyosis, causes his skin to peel away in fish-like flakes because of his inability to sweat or breathe through his skin. I had no idea that pores were so important to bodily heat regulation and good health; I just figured they got clogged up and caused pimples and sprouted hair when not involved in sweating. Unfortunately for Song, there’s no cure for his condition. Like the Tree Man of Java and the Shell Man of China, the only thing they can do is treat the symptoms, not the root cause.